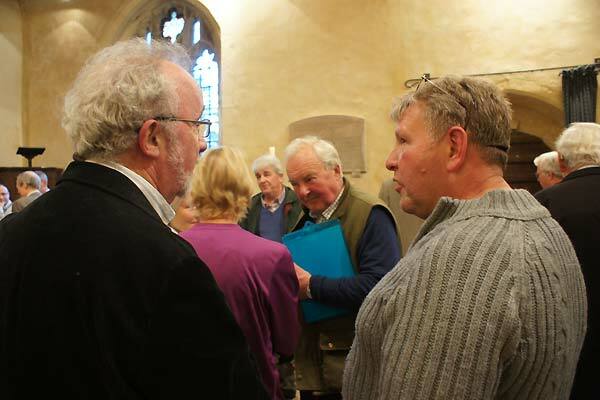 There was a disappointing turnout at the One Hundred and Twenty Second Farringdon Village Meeting held in Farringdon Church on Wednesday evening (6th April). Excluding those attending in an official capacity around Farringdon residents were in the audience to hear reports from Parish and County Councillors. 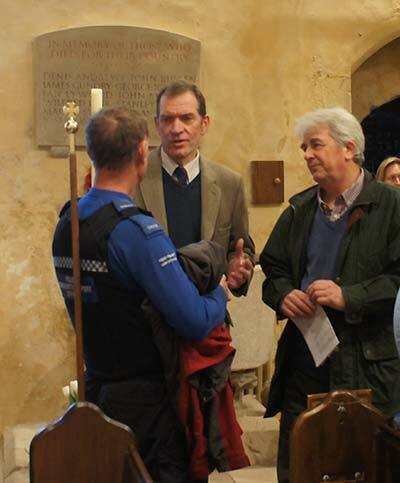 Including Farringdon Parish Council member David Williams (right) FPC Chairman Clive Elderton, (centre) seen here talking to PCSO David Nops, one of the Local Policing Team. Perhaps those that stayed away had some inkling of the excitement that would be generated by Item number three on the Agenda, an "Update Briefing" from Hampshire County Councillors on the A32 Flood Action Group, which, from the report that followed would suggest that " .action . ." when used in regard to HCC activities might require a fairly liberal interpretation of the the accepted usage of the word. It took Hampshire County Council Head of Strategic Planning, Chris Murray and Flood and Water Investigations Officer, Paul Prowting, approximately half an hour to inform the meeting that the various case studies were still a "work in progress". Another half hour was taken to to provide fairly non committal answers to a few questions, the majority of which were from the Chawton residents present, which were mainly concerned with sewage contamination of flood water, which we discovered, was the responsibility of Thames Water who, for some inexplicable reason, were not involved in the impact and water flow studies. On hearing that the impact study on the effects of the flooding on residential and commercial properties along the A32 had been completed. Chris Trower, who leases several commercial units at Farringdon Industrial Centre, wondered how this could have been achieved without any approach being made to him or his tenants. It fell to Patrick Fuller to bring the discussion to an end when he pointed out that there is no guarantee that these prolonged studies would actually achieve any practical engineering solutions that would be financially viable and, even if a scheme to alleviate the flooding was proposed, nothing would happen for another three years, and probably some years beyond that. 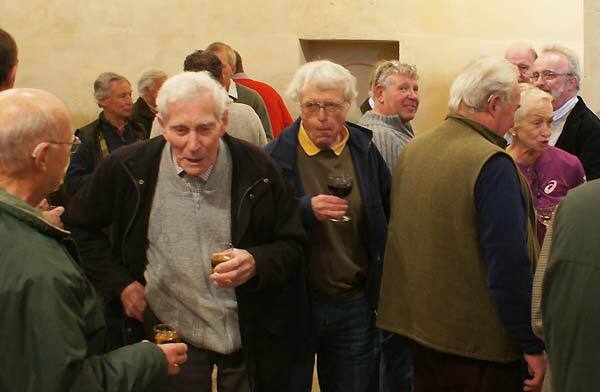 Sensing that a brief refreshment break might be in order, Dawn Perry was soon topping up the glasses with red while FPC Vice-Chair Susan Anderton (foreground right)was in control of the white others took the opportunity to stretch their legs and recover from the excitement of the previous hour including Parish Councillors Terry Cubitt (below left) with Nick Newens while David Horton keeps a firm grip on the paperwork in the back ground. The excitement proved too much for the Chawton residents who took the opportunity to set off home leaving those who remained to prepare for the reports of various village activities. This picture was taken earlier in the evening as the audience warmed up for what was to come . 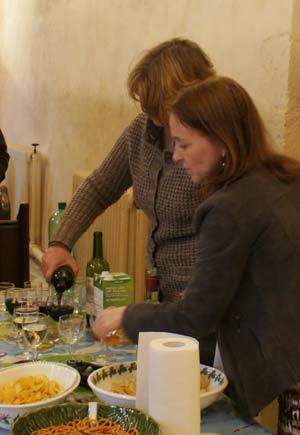 There appears to be one who was under the impression this was a wine tasting event! After a brief report from Parish Magazine Editor Patrick Fuller (moved up the order to wake everybody up.) PCSO Nops gave another brief report to point out that Farringdon had one of the lowest crime rates in the area, which will hopefully continue in the future. He did face one or two questions about drivers exceeding the speed limit in the village, and the answer which came as no surprise to residents, pointed out that those who were caught by the occasional patrols included a number who reside within the Farringdon Parish Boundary. Mark Kemp Gee, gave a brief synopsis of his report from HCC in which he announced that the pothole ridden Gaston and Hall Lanes were down for resurfacing in the next financial year and also expressed his opposition to a government plan to create a new authority, including Portsmouth, Southhampton the Isle of Wight and for some inexplicable reason East Hampshire district was included as " . . part of the London Corridor . . which would no longer be under the control off Hampshire County Council. The ever apologetic East Hampshire Councillor, Tony Costigan, was not present at the meeting but Clive Elderton gave a brief resume of his report which seemed to indicate that the absent Councillor was in favour of this plan, despite no previous consultation with either parish councils affected or the residents of those areas. Reports on the Playground Charity and the Financial report from the Parish Council passed without comment. Peter Durrant gave an update on the development of the Folly and stated that he had been assured by the developers that once the detailed plans had been given the go ahead, the renovation of the Folly would be the first priority with the building of the two houses in the old school playground following on. Peter announced that some sites for a new village were under investigation by the working team but for obvious reasons the actual locations could not be made public while negotiations with the landowners were in progress. Clive made an appeal for input from the village to decide what the requirements for a new hall might be, possible location, and how individuals might use the new building. The meeting ended well after nine and the those attending dispersed into the darkness.